The State Department has held just ten "daily" press briefings since Secretary of State Mike Pompeo was sworn in three months ago, averaging less than one per week and now drawing the attention of the top Democrat on the Senate Foreign Relations Committee. In a new letter to Pompeo obtained by ABC News, Sen. Bob Menendez, D-New Jersey, calls on Pompeo to reinstate the daily press briefing, which dropped down to just twice a week under the Trump administration. "At a time of unprecedented, head-spinning developments for U.S. foreign policy, our relationship with our allies, and our role on the world stage, the lack of interaction with the American public and the world via the press is particularly concerning," wrote Menendez. "The public deserves to hear—either directly from you or your spokespeople — how the Department is protecting and advancing our interests around the world." The briefings, traditionally televised daily, have been a fixture since the Eisenhower administration, and are watched closely in Washington and around the world for guidance on U.S. foreign policy and reaction to world events. A former State Department spokesperson, speaking to ABC News on background, said they are crucial because they push out America's message, measure that message against reporters' questions, provide guidance to U.S. embassies around the world, and provide transparency for the U.S. public. But the current State Department spokesperson, Heather Nauert, is the only official who briefs from the podium at the agency now. She travels with Pompeo for all his trips – something that she rarely did with her previous boss, Rex Tillerson – so she has been out of the country for days at a time with him. 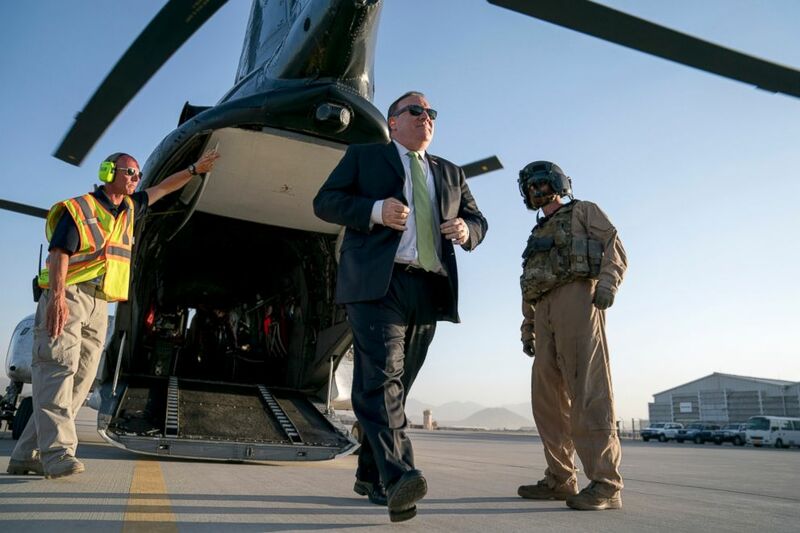 (Andrew Harnik/AP) Secretary of State Mike Pompeo arrives back at Camp Alvarado in Kabul, Afghanistan, July 9, 2018, after meeting with Afghan President Ashraf Ghani. But when she is gone, there is no one to backfill and brief. Nauert has an acting deputy, an experienced diplomat named Elizabeth Fitzsimmons who started in April, but she is on a temporary assignment this summer and has never conducted a daily press briefing. She also pointed to the greater access for reporters traveling with the secretary. While Tillerson at first barred reporters from traveling with him, he eventually allowed two journalists and then six – a rotation that meant a very limited press contingent and that left others trying to keep up through commercial travel. In contrast, on his most recent big trip from East Asia through the Middle East to Europe, there were 13 journalists on board with Pompeo, who has also done more interviews than his predecessor. But the result of so few briefings is that, at times, the U.S. has appeared silent or slow on a given issue. After Trump met Russian President Vladimir Putin last Monday, for example, the Russians immediately began providing details of what the two leaders agreed to, some of which was misleading. But Nauert did not brief until Wednesday, and even then she had few details to share, creating more confusion about what happened during the summit. The former State Department spokesperson said briefings are an impossible challenge under the Trump administration because the president has upended the normal policy-making process. State Department officials "have little knowledge of what the policy actually is, little ability to shape that policy, and little faith that once shaped, the policy will not be undermined and overturned by the president himself," the former spokesperson said. "The only thing more disconcerting than not having a daily press briefing at the State Department is the fact that such a briefing, in such an administration, is neither possible nor feasible. You have to have a foreign policy first." Under Pompeo's tenure, the ten briefings have been on average 32 1/2 minutes long. During the same three-month period in the last year of the Obama administration, there were 60 daily press briefings, that averaged 45 2/3 minutes long. The State Department is not alone either. There has not been an on-camera Pentagon briefing with chief spokesperson Dana White since May 31. The daily press briefing has had a rocky history under the Trump administration. For the first six and a half weeks, there were no briefings, until Mark Toner, a well-respected Foreign Service officer who had been deputy spokesperson in the Obama administration took over as acting spokesperson. But Toner briefed only four days a week, not on Fridays, and there were a few weeks with no daily briefings before his time ended in April. After another hiatus, the Trump administration finally started briefing with Nauert, the former ABC News correspondent and Fox News anchor, as its spokesperson. Although her hiring was announced in April, Nauert's first briefing was June 6. But the schedule was even more limited with only two briefings per week, on Tuesday's and Thursday's. That has been the standard since, with some weeks having even fewer briefings because of scheduling conflicts. On weeks when Nauert is off, there have at times been specialized policy briefings over the phone with a senior State Department official addressing a specific topic, but those are limited to that issue and not always relevant to the news of the day. 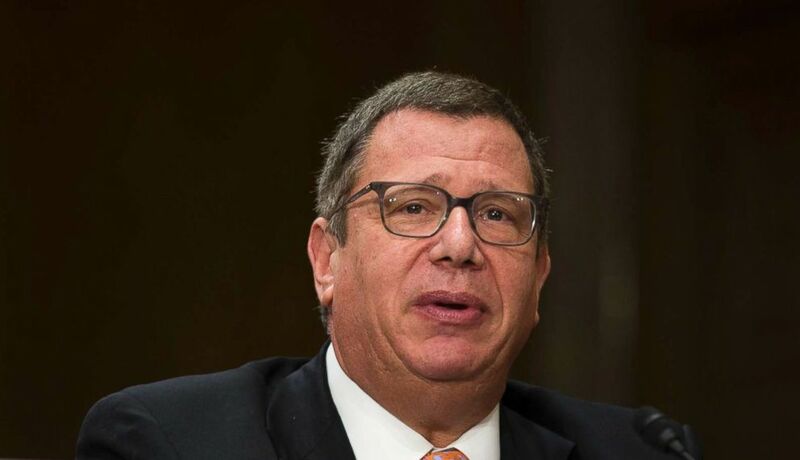 (Alex Edelman/picture-alliance/DPA/AP) Irwin Steven Goldstein during his confirmation hearing to be Under Secretary for Public Diplomacy at the United States Department of State, before the United States Senate Foreign Relations Committee on Capitol Hill in Washington, D.C., Nov. 1st, 2017. In December, Steve Goldstein, a communications and marketing executive, was sworn in as the Under Secretary of State for Public Affairs and Public Diplomacy, the agency's top official that "leads America's public diplomacy outreach" by "informing and influencing foreign publics and by expanding and strengthening the relationship between the people and Government of the United States and citizens of the rest of the world," according to the department. In addition to overseeing the daily press briefing and other media outreach, the Under Secretary is also in charge of educational and cultural exchange programs and counter-messaging against propaganda from terror groups like ISIS and rogue countries like Russia and Iran. But the role of spokesperson was often confused between Nauert, who continued to brief twice a week, and Goldstein, who spoke often with reporters – until Tillerson was fired by Trump, and Goldstein shortly thereafter. On the day Tillerson and Goldstein were aexed, Nauert was promoted to acting Under Secretary for Public Affairs and Public Diplomacy, adding to her plate even as she continued to brief only twice a week. The Trump administration has yet to put forth a full-time nominee for the role, one of only six Under Secretary positions and one of the senior-most jobs at the department.